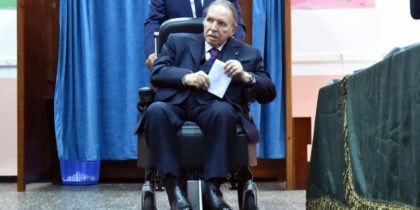 Algeria has finally announced the holding of presidential elections among indicators that ailing President Abdelaziz Bouteflika may run for a fifth term. The 81-year-old president who has been in power since 1999 has not spoken in public since he suffered a stroke in 2013. Yet, indicators show that the king makers within the Algerian regime have not agreed on a successor to Bouteflika as the generation that has fought the liberation war passed out. Algeria’s ruling party, the FLN, “wants the president to continue his mission he started in 1999, as head of the state,” the party’s Secretary General Djamel Ould Abbes said last year. Analysts deem that the contending clans within the Algerian regime want to maintain Bouteflika in power as a time buying measure in a sign that bodes ill for the country’s future. The Algerian regime was long distinguished by its opacity, where power is generally presumed to reside among groups of military leaders, intelligence officials, businessmen, and politicians collectively known as le pouvoir. In 2014, in light of the president’s failing health, the military thought it unwise for Bouteflika to run for a fourth term. Yet, he did and he won. If Bouteflika runs for a fifth term, the Algerian regime will leave little hope for a transparent and peaceful transition from Bouteflika’s era to the next amid worrying indicators of dwindling oil revenues, social unrest and regional instability.